The outcome is as predictable as the premise is outrageous in this crowd-pleasing 3D animated comedy. 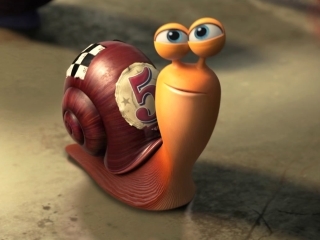 Turbo is a very cute movie with lots of great animation and elements that the kids are going to love. It's just a bit hard to swallow. The animated races are fast and fun, the jokes are hip without being too snarky and the starry voice cast is super. The graphics are colourful and kinetic in a souped-up computer game sort of way, and there's pleasure to be had in watching the racetrack zoom by at full throttle. The racing set-pieces are fizzy enough, but you have to wonder if teaching snails not to be content with their given snail speed is the right message to put out there. The picture has an energy which dares you to confine the term 'snail's pace' to history. Whizzy and superficial, this isn't the most complicated animated film ever made, but it's a lot of fun if you can buy into its silly premise about a snail who moves at super-fast speed. Keys perfectly into being young and little. It's good fun, especially for smaller children, and looks fabulous. A perfectly enjoyable and often funny animation film with a stellar cast behind it, but the predictable storyline and underwhelming 3D effects are a little disappointing. A zippy and good-natured adventure that hones in on its target audience from the get-go.